The Humber Hawks athletics didn’t win as much as they set out to do in the 2017-18 season, but they still proved their dominance throughout the Ontario Colleges Athletic Association. “It was a different kind of year for us, we certainly didn’t attain the medal count we usually do, but we were close,” said Jim Bialek, manager of sports information. 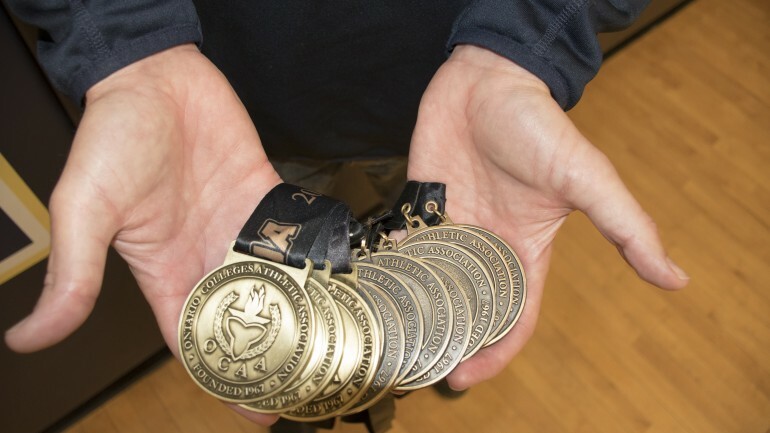 Bialek’s modesty belies Humber varsity teams’ impressive haul this season in precious metals at the provincial level that could need a bank vault to store. Varsity teams won OCAA gold in women’s basketball, women’s volleyball, men’s individual golf, men’s badminton doubles, women’s badminton doubles, mixed badminton doubles, and in both men’s and women’s indoor soccer. Humber took silver in men’s basketball, men’s baseball, men’s volleyball, women’s rugby 7s, women’s soccer and women’s cross country 6K. The men’s soccer team brought home a bronze. The varsity teams won two National gold titles — in women’s basketball and women’s doubles badminton — and two silvers, in mixed badminton and men’s doubles badminton. There were also many fourth place finishes where Humber missed bringing home any hardware. While volleyball and basketball garners the most attention, the Hawks made it to make the podium in the other sports, Bialek said. “Men’s basketball hit a bit of a blip but they played in nationals with a very young team,” Bialek said of their play at CCAA nationals. But at the provincial finals, Humber knocked out the favourites Redeemer before taking an unexpected trip to the final match against Seneca. Hard work is what has kept the Hawks successful through the years, even with the regular changing of the rosters. The women’s volleyball team is the best example of that. “Why is the women’s volleyball winning 11 straight?” Bialek asked. “They work hard. “It’s not like having the same team like the Edmonton Oilers over four years and have Gretzky every year,” he said. Varsity teams have to reinvent themselves on a regular basis because of the revolving door that’s called graduation. “The girls that played 11 years ago have been gone for eight years, the girls who have played eight years ago have been gone for five years,” Bialek said. Bialek said success also comes from the coaching, with each coach knowing the organization for years before they get the job as a head coach. Men’s volleyball coach Wayne Wilkins has been one for 23 years, while brother Chris has held the helm as the women’s volleyball coach Wilkins for 20 years. Women’s soccer coaches Vince Pileggi and Mauro Ongaro have been there for 18 years, Bialek said. “When you look at the first half of the year, anybody would go, ‘wow, what a good year,’” Bialek said. The teams’ tallies don’t include individual honours, like men’s baseball Liam Sutherland winning the MVP award, and basketball’s Ceejay Nofuente winning the same award. “We are averaging 20, 22 podium finishes a year, where other people are averaging three, four, five, maybe six tops, the best is probably averaging about six,” Bialek said. Students at Humber are encouraged to help cheer on the teams and will get a true experience with the production and skill of the players at the games. “The entertainment is incredible,” he said. With the party in the stands and the talent on the courts, “you are not just going to sit there on your hands,” he said.